The students at High Rocks over fall break. Photo by Mark A. Shephard. In some ways the Haverford campus and High Rocks couldn't be farther from one another. The former is nestled mere miles from Center City Philadelphia, one of the most populous cities in America, and the latter's West Virginian locale is so rural and remote that its own website urges visitors not to trust GPS or Google directions to find it. But in other ways—such as their educational missions and focus on critical thinking and leadership skill—they are actually quite close. This past fall break, as has been the tradition for the past six years, Haverford students helped bridge that divide by traveling the almost 400 miles of mountainous terrain between the two campuses and devoting their vacation to service learning at the rural nonprofit. 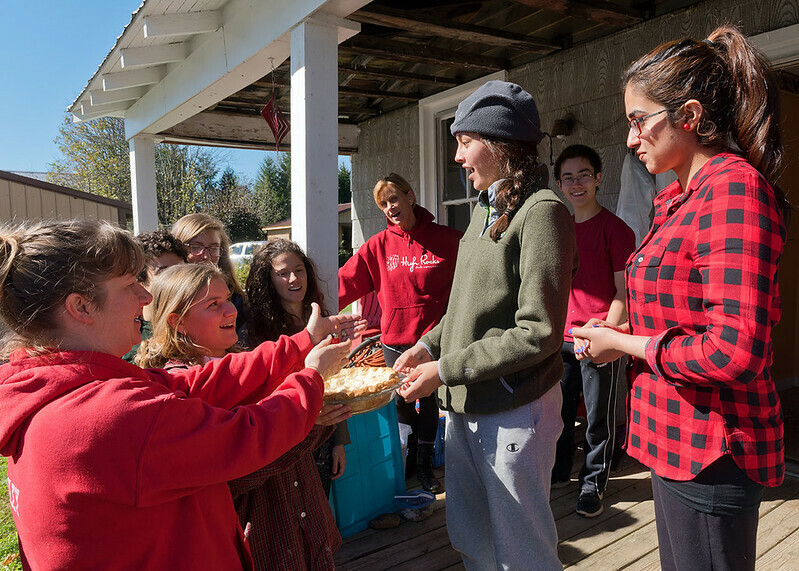 High Rocks is a place where young women, ages 12 to 25, from the surrounding Appalachian communities, learn to be leaders and develop the confidence and skills to succeed academically and as citizens. "I wanted to change the way girls thought about themselves," founder Susan Burt told Haverford magazine back in 2011 about the nonprofit's founding. "I wanted to create a place where girls don't judge each other or put each other down." The former middle school "gifted program" teacher (and mother of Joanna Burt-Kinderman '98) launched High Rocks in 1996 as a summer-camp intensive focused on academic and personal growth, and it has steadily expanded to include year-round programming, including tutoring, college preparation, classes, cross-cultural learning trips, and group service projects. (All of these programs are free or very low cost.) And for the last 12 years, Haverford College students have been part of helping it grow and flourish. The Center for Peace and Global Citizenship (CPGC) first partnered with High Rocks back in 2005, sending one or two female-identifying student interns to West Virginia each summer for 10 weeks. Those students essentially served as camp counsellors, creating curriculum, acting as mentors, and leading activities. A couple of years later, the program broadened to include fall and spring service learning trips (open to students of all genders), which are less hands-on with the girls High Rocks serves, and more devoted to nitty-gritty tasks that help the nonprofit operate, such as building, cleaning, and maintenance projects. "For the CPGC, the fall break trip expands our relationship to High Rocks by the number of students able to participate," said CPGC Associate Director Janice Lion. "Each intern we sponsor has been able to contribute to the work of High Rocks in significant ways over the course of full-time work over the summer. But the fall break trip invites many more others to get to know and make a small contribution to this fabulous organization." So this past October, the CPGC sent nine students back to West Virginia, led by Becca Richie '20 and Claudia Rivera '18, who were both interns at High Rocks last summer. During their weeklong stay, the Fords helped paint, clean, and renovate a guest house in the nearby town of Hillsboro that High Rocks uses as lodging for interns and other workers; and weeded and winterized two of High Rocks' gardens, which are used for teaching and growing food for their summer camps. They also attended workshops and visited High Rocks' Youth Center in Lewisburg, which is home to its after-school programs. "The trip went really well and the students served as excellent ambassadors of Haverford," said Lion. "Janet Swift, who managed our crew's experience, called the Haverford students 'cooperative, engaged, polite, a joy.' She was impressed that there were no bad attitudes, even though it was clear that some had never held a paintbrush in their hand before. Students were able to help them get a lot of important home-improvement tasks completed, making the house where summer interns and other visitors stay a very pleasant home away from home." "This trip only further cemented for me how much I love High Rocks, the people I've met, and West Virginia," said Rivera, who is headed back after graduation as an AmeriCorp volunteer. "It took another piece of my heart. Now I am sure I want to go back and be a part of it." For Richie, returning to the place where she spent such an influential summer, was particularly meaningful, not just because she was happy to reconnect with the people and places she had been missing, but because—like the girls High Rocks serves—this place had helped her become a leader and she was now able to exercise some of those leadership skills with the Haverford student group. "I had a better sense of how the organization needed me and the rest of the students to operate in order to achieve the goals we set out at the beginning of the week," she said. "I also was more ready to receive the moments of beauty and pleasure because I was less focused on taking everything in for the first time." Richie, like Rivera, is eager to return to West Virginia—"My heart is calling for the mountains," she said—but, for the time being, she is dedicated to helping to bring High Rocks to Haverford. She would like to see the Office of Admission adapt an application awareness for girls applying to Haverford from the program, and she is working with the CPGC to invite community organizers from West Virginia to run workshops on campus. "I think this trip is just another reason I’m able to reflect back on my decision to come to Haverford and be very, very thankful," she said. "I’m thankful to be a student at an institution that has sent me to a place I otherwise never would have known. High Rocks has helped me become someone I never would have otherwise been." "This trip reminded me that being a global citizen starts at the local level," said Rivera. "I came out of this experience with the lesson that you cannot be a citizen of the world without being a citizen of your own home first." Photos by Mark A. Shephard.